Assign tasks. Structure is essential with any activity involving children, so give your kids a specific job to do, such as spreading mulch in a garden bed, gathering sticks, pulling up weeds or digging small holes for seeds. Invest in the right tools. Buying child-sized gloves and gardening tools will be worth the investment. Not only will it excite your children to have their very own supplies; it will enable them to work more effectively in the garden, avoiding frustration and meltdowns. Give them their own garden. If space permits, assign a small garden bed or patch of dirt to be your child’s own private garden. 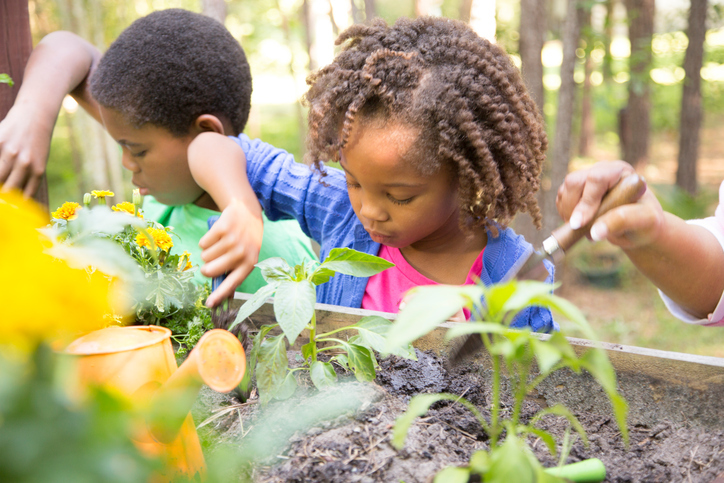 According to DIYNatural.com, it’s empowering for kids to plant as they see fit, tend their garden and watch the progress. Let them choose what to plant. Now that they have their own space, provide a little guidance, then let them choose what they’d like to plant. Steer them toward hearty plants and vegetables so that they can reap what they sow. Make it fun. Be sure to make garden maintenance, from watering to weeding, a fun, social time, advises LivingWellMom.com. Sing and chat together, and never do these chores in the heat of the day. Indulge in a little water fight now and then, or let them run through the sprinkler. The idea is to make sure your child associates gardening with fun. Finally, be sure your children enjoy the fruits of their labor, whether that means helping them prepare a meal that includes the veggies they grew, or creating a floral arrangement with flowers from their garden bed. Encourage them to draw and take pictures that document their gardening endeavors each season so they can see how they’ve grown in the process, as well. please contact us at PR@CBHarper.com or call (210) 483-7017.